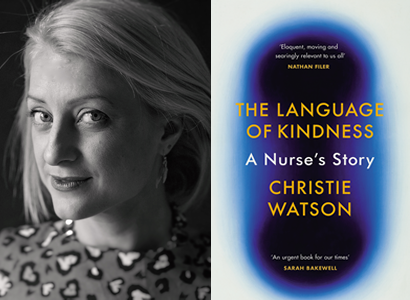 Join us for an evening in the company of Christie Watson as she talks about her memoir The Language of Kindness: A Nurse’s Story – a tender, informative and unflinching account of what it means to be a nurse. Christie Watson was a nurse for twenty years. Taking us from birth to death and from A&E to the mortuary, The Language of Kindness is an astonishing account of a profession defined by acts of care, compassion and kindness. We watch Christie as she nurses a premature baby who has miraculously made it through the night, we stand by her side during her patient’s agonising heart-lung transplant, and we hold our breath as she washes the hair of a child fatally injured in a fire, attempting to remove the toxic smell of smoke before the grieving family arrive. In our most extreme moments, when life is lived most intensely, Christie is with us. She is a guide, mentor and friend. And in these dark days of division and isolationism, she encourages us all to stretch out a hand. The Language of Kindness is a remarkable paean to nurses, in which Watson reminds us not only how special they are, but also that, one day or other, we will all — as the loved ones of patients, or as patients ourselves — come to rely on the kindness of such strangers. Christie Watson has written a timely, moving and unforgettable book about a profession under enormous strain. Don’t miss this chance to hear her story as she shares the tragedies and joys of her career capturing the very essence of nursing today. Tickets: £6 (£5 redeemable against a signed copy of The Language of Kindness). Includes a glass of wine / soft drink on arrival. Tickets available from the bookshop, or purchase online (with booking fee).